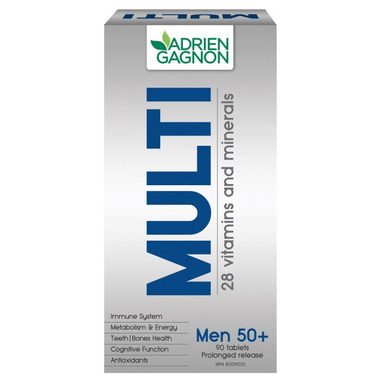 Adrien Gagnon Multi Active Men 50+ contains all the essential vitamins and minerals to maintain healthy body functions. Vitamin and mineral requirements change as we age and as our metabolism slows down. After age 50, many of the body's physiological functions become sluggish and less effective, and the risk of developing certain diseases increases. Multi Active Men 50+ has been developed to prevent metabolic slowdown, decrease the risk of developing age-related chronic diseases and reduce oxidative stress. Multi Active Men 50+ supplies a specific, complete combination of vitamins and minerals enriched with recognized plant extracts to prevent deficiencies and metabolic slowdown. Saw palmetto and pygeum help reduce the severity of prostate problems. Lutein and bilberry extract help maintain eye health and prevent macular degeneration. Ginkgo and huperzine contribute to maintaining brain activity and preventing memory disorders. Lycopene and green tea extract are potent antioxidants to protect against cell damage caused by free radicals. Consult a healthcare practitioner prior to use if you have impaired liver function or if you are taking blood thinners. Adults: Take 1 tablet daily, at mealtime.